I am a snacker! 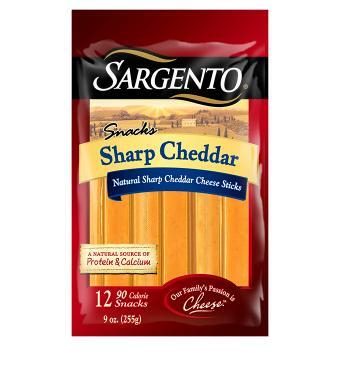 I love to keep things around that are wholesome to snack on and I love Sargento Natural Cheese to snack on and it works so great to keep my protein grams up. I seem to have a difficult time keeping up with what my body needs. Nutritionist Mitzi Dulan, in partnership with Sargento gives these tips to help you snack smart. Pack on the protein. Sargento Natural Cheese Snacks contain 4-8 grams of protein per serving, helping keep you fueled and satisfied throughout the day. The convenient single-serve packaging makes it simple for on-the go snacking. Get fruity at least three times a day. Choose fruits that are nutritional powerhouses like watermelon which is a hydrating fruit and loaded with lycopene, a powerful antioxidant. Frozen grapes are another great fruit to snack on. Grapes are high in polyphenols which seem to protect the health of our cells. Variety is key. Aim to eat a rainbow of colors, even with your snacks. This helps you to eat a nutrient-rich diet. From baby carrots and red grapes to kale chips and Sargento Sharp Cheddar Cheese Snacks, eating different colors means you’re getting a variety of nutrients. Spread it on. Keep your cravings at bay by mixing a can of tuna with 1/4 of an avocado and spreading it on crackers. Pick-me-up smoothie. Instead of reaching for a caffeine drink, try a berry smoothie. Greek yogurt, strawberries, blackberries, blueberries and a touch of honey will meet your sugary fix. Dip and eat. Use celery, cucumbers, carrots and broccoli as fiber-filled dippers with a cool spinach or garlic dip. You can also pair with beet hummus for a boost of flavor. Snack consciously. Make sure you eat mind fully and give full attention to your snacks while you are eating instead of watching TV or performing other unconscious eating behavior. This will help avoid overeating. Sargento has so many varieties to choose from I am sure you will find a favorite among them for yourself and your family! My kids like to put the cheese sticks wrapped in a warm tortilla and make quick quesadilla’s. Which will be your favorite? I have been dying to try these. My usual favorite is Frigo Cheese Heads. I have also gone with Kraft and Target brands. This seems to be the most genuinely authentic Italian. I like that they now come in a variety of flavors. Cheese sticks are easy to pack in lunches, take on trips, or just eat at home. Gives you a bump of protein and tastes good. I LOVE cheese! The sharp cheddar is my absolute favorite. I snack on string cheese all the time. I really like Sargento’s too. It is one of my favorite snacks as well! I am diabetic so the extra protein is essential!